You're going to Sweden? That's so funny! I'm actually from there. I hope you'll have an amazing time. Let me know if you need any suggestions or tips. I adore those jeans, and especially with that jacket. I don't own any crazy patterned jeans like that but they're oh so very tempting! Have a lovely time in Sweden, I'll be following along on Instagram! Yup, like I've said before. The best dressed and most chic looking photographer I know. Oh you are travelling to Sweden! :) I hope you will enjoy your stay here. Can't wait until I get to see some pics here and on instagram. Safe travelling! 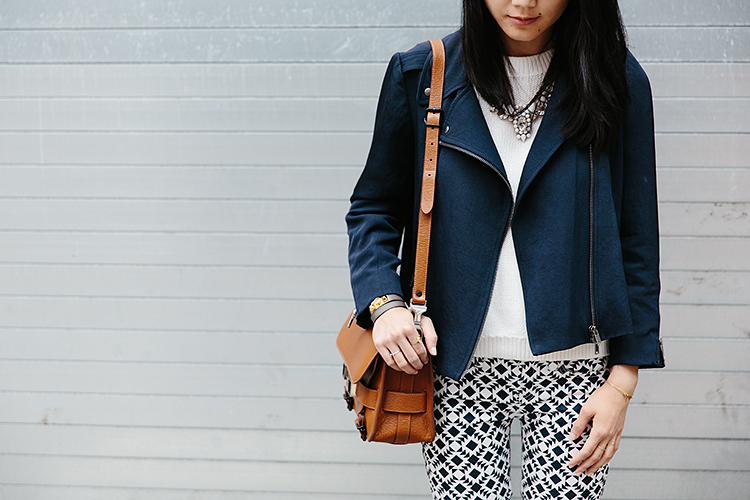 You do such an amazing job styling your printed pants! Crazy print pants = pajama pants for daytime! And that is why I love them :)If only I could pull them off as well as you! maybe crazy, but definitely not outrageous, they look great. That's such a great outfit, just the right amount of crazy ;) Have fun in Sweden! What a lovely ensemble! I think I'm going to catch your fever soon if you keep posting awesome prints like that! Have fun in Sweden! I'll be heading that way in a few weeks too and I can't wait to see awesome pictures and cool recommendations! Love the combo. 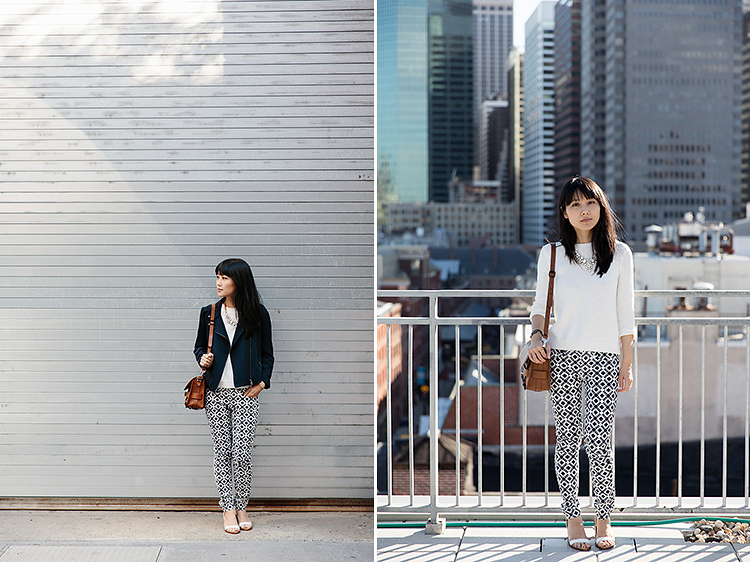 Inspires to get a pair of patterned pants! omg so jealous! i'd love to go to sweden too! It would be awesome if you check out my new inspiration post! This is my first time visiting your blog and I love it! Wonderful pictures. I'm into crazy pants as well :). Alice, you always look very stylish. Look who I found on Club Monaco Inspiration board! I'm so jealous, you travel so much! Love these pics. I absolutely love your style and outfit posts! Would you mind sharing how tall you are and what size clothing you normally wear? You seem petite like me (and I have the hardest time finding clothes that fit), however everything you wear looks so great on you! I'm 5'2 and usually wear an XS, though I like my tops to be a bit on the looser fit. I always have trouble in the pants department because I have a short short short inseam!